Since t he Bahrain Crisis of early 2011 and the beginning of the Arab Spring Bahrain is, actually, a Saudi proxy in constant tension between the ‘original” Sunni population, now a minority in Bahrain. and the foreign workers, almost all of them from Iran and Southern Shiite predominated Iraq, now a wast majority of Bahrain population. Bahrain is therefore one of the friction hotspots of the Middle Eastern confrontation between Sunni and Shi’a and between Iran and Saudi Arabia. 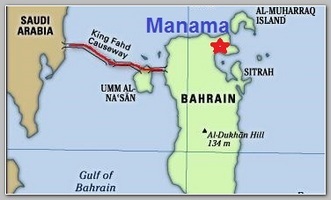 Bahrain is connected to Saudi Arabia with a series of bridges and causeways with a total length of 25 k”m, known as the . Bahrain said, on early 10/01/2015, it has uncovered one of the biggest finds of explosives and weapons since violence erupted there in 2011. Police say 1.4 tonnes of high-grade explosives were found in an underground vault south of the capital Manama along with rifles and hand grenades. The Bahraini interior ministry said the material had been seized in the Nuwaidrat district and matched explosive traces found at a series of recent attacks in the Gulf state and “a number” of arrests had been made. Police chief Maj Gen Tarik Al-Hassan said to reporters that the perpetrators were linked to elements in Iran and Iraq. No doubt that Bahrain is a part of the new Sunni-Shia war in Yemen .